You should never feel cooped up when you’re on a camping trip. After all, what better way to enjoy the freedom of the great outdoors than to sleep beneath the stars? Unfortunately, many tents are small and restrictive, making you feel crowded when you should feel the most free. That’s where a 6-person tent comes in handy. Whether you’re camping by yourself or with a family of four, a 6-person tent is a great way to improve your comfort and to make sure everybody has plenty of breathing room. If you’re in the market for a tent that will last you for many years, consider the Kodiak Canvas Flex-Bow Canvas 6-Person Tent on your next shopping trip. This six-person tent is one of the best models you can get for your money, and since it’s backed by a limited lifetime warranty, you’ll never have to worry about finding another. One of the more sophisticated six person tents available, this model is designed with superior Hydra-Shield technology. This technology provides maximum breathability and waterproofing capabilities, allowing it to hold up in weather conditions that are less than ideal. From snow to rain to heavy winds, this tent can handle it all. The tent is finished with a silicone, dry finish treatment. This provides a watertight seal that will keep you comfortable and dry even in a downpour. Plus, since the tent is not made out of synthetic fabrics, it still allows water vapor to escape. This innate ability of the tent to release water means you won’t have to worry about moisture build-up or mold or mildew growth as a result. The tent is built with tempered, spring steel rods and one-inch steel tube poles. Go ahead – just try to knock this tent over in a windstorm. Set-up takes a few minutes, but once you are set-up, you’ll be hard pressed to find a tent that is more resilient to heavy winds and adverse conditions. The tent also has four large windows, making the tent feel less claustrophobic and also providing added ventilation. 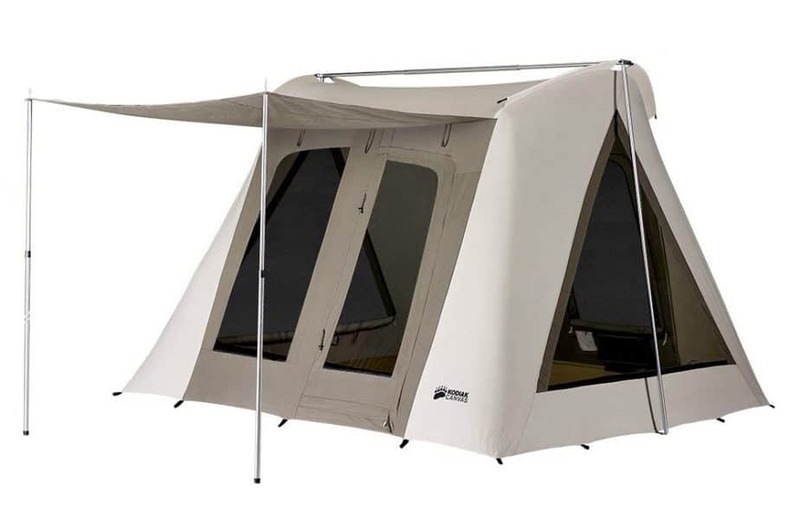 Most tents have only one or two windows, giving the Canvas Flex-Bow a serious leg up on the competition. This product even has two funnel-flow vents, increasing airflow on even the stuffiest of summer days. You may wonder how the windows work against pests like mosquitoes and no-see-ums. The short answer? Fantastic. Each window has added mesh for additional protection against biting pests, allowing you to sleep in comfort without spending the night being chewed on by bugs. With ceilings that stand over six feet in height, this tent is one of the best for taller campers. You don’t have to worry about your head constantly brushing against the ceiling or getting stuck while trying to move around inside. Still not convinced? Here’s why the Kodiak Canvas Flex-Bow far surpasses other 6-person tents. Customers claim that this is the best tent for winter camping. The tent is designed with 100 percent cotton duck canvas. This material is durable and waterproof, while at the same time offering ventilation that you just don’t usually get with thick tent fabric. Because it is made out of such rugged material, it holds up well to adverse conditions and minimizes common issues caused by winter camping, such as excess humidity and the build-up of condensation. Even better, the tent is backed by a lifetime limited warranty. While it’s rugged in itself, the warranty offers security in that you don’t have to worry about tears or leaking, and if you do, the company will go good on its product. 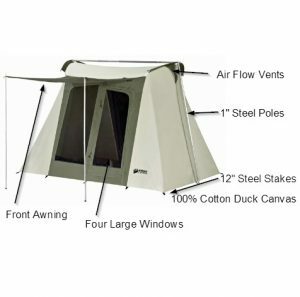 The Kodiak Canvas Flex-Bow Canvas is without a doubt one of the best 6-person tents on the market. Offering comfort, resilience, and style, this watertight tent is a fabulous option for all camping settings. Whether you’re headed out to camp in the backwoods or just out of the back of your car, no matter whether it’s winter, spring, summer, or fall, this six-person tent truly offers it all.